Turkish Talmudist of the seventeenth and eighteenth centuries; son-in-law of Elijah Ḥako, author of "Ruaḥ Eliyahu." 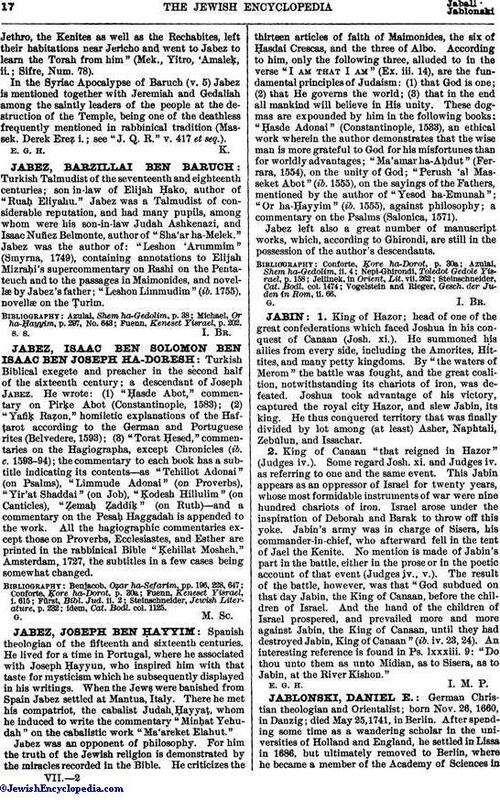 Jabez was a Talmudist of considerable reputation, and had many pupils, among whom were his son-in-law Judah Ashkenazi, and Isaac Nuñez Belmonte, author of "Sha'ar ha-Melek." Jabez was the author of: "Leshon 'Arummim" (Smyrna, 1749), containing annotations to Elijah Mizraḥi's supercommentary on Rashi on the Pentateuch and to the passages in Maimonides, and novellæ by Jabez's father; "Leshon Limmudim" (ib. 1755), novellæ on the Ṭurim. Fuenn, Keneset Yisrael, p. 202.